 » Second Class » You&apos;re currently reading "Ms Ryan’s Second Class"
Welcome to Ms. Ryan’s 2nd class! What a term we’ve had! At the start of the year we went on a mini-beast hunt around our school. We looked closely for minibeasts in different habitats and recorded what we saw and where we found them. Some of the minibeasts were not so mini! We have been learning all about our locality in SESE. We created maps of Shankill and discussed the bridges in our area. This was so interesting as we didn’t notice how many different types there are. We learned all about how they stay up and what they are used for. We even tested a few types of bridge structures using paper to see which could hold the most weight. Last week was Maths Week! We had lots of fun challenging each other on Mathletics for our homework. We also challenged other children in the school and around the world! We discovered maths all around us both at home and in school with scavenger hunts and a maths trail. 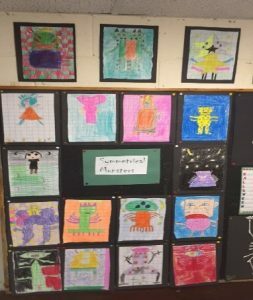 For art we created some spooky symmetrical monsters. Let’s hope the year continues as successfully as it started. 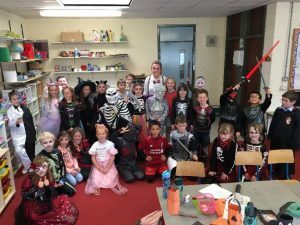 Happy Halloween from Ms. Ryan’s class!